.44-40 Winchester ammo (also known as .44-40 WCF) is closely tied to the Winchester Model 1873 rifle for which it was originally produced. One of the most common calibers used in the "Wild West" period, it remains popular today for cowboy action shooting (CAS) and can also be used in a hunting role. 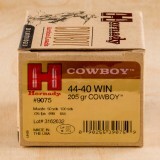 Today, shooters that love single action shooting will find our in-stock line-up of 44-40 ammo for sale on this page. 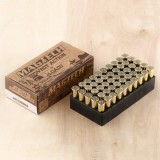 44-40 ammunition fires a heavy bullet weighing over 200 grains with a muzzle velocity of around 1,200 feet per second. 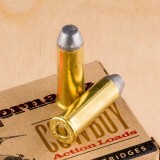 Cowboy loads are typically lower-power loads designed to facilitate rapid accurate fire and use lead nose bullets suitable for steel target shooting. Winchester and UMC (now part of Remington) were the earliest companies to produce ammo in this caliber. 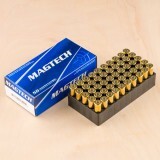 However, other manufacturers including Black Hills, Federal, Magtech, and Hornady also produce .44-40 ammo. The 44-40 Winchester was Winchester's first metal cased round and was originally used in their Model 1873 rifle that was incredibly instrumental in shaping the western United States into what it is today. With its incredible power and efficacy, the 44-40 Winchester has taken down more deer than any round in the world except the 30-30 Winchester. When you use this old round, you have everything you need for hunting, cowboy shooting, range training, and more. Since the end of World War Two, Hornady has been pumping out some of the best ammunition in the world, coming up with some of the most innovative and effective bullet designs we have. Firing at 725 feet per second, these 205 grain, lead flat nose, brass cased, boxer primed rounds are perfect for all your range training needs, as well as taking to your next cowboy action competition and due to their flat point, make easy to score holes in the target. Want to be a cowboy? With your Winchester Model 1873, you have one of the most significant rifles in cowboy history. 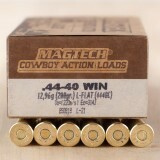 With Magtech's Cowboy Action 44-40 Win rounds, you will have your rifle firing without a hitch. 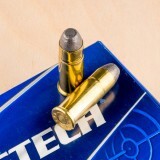 In the nearly 100 years that Magtech has been around, this Sao Paulo based company has come to be one of the most innovative ammo manufacturers. You can't go wrong with Magtech. Firing the massive 200 grain rifle bullet at 721 feet per second, this round is great for range training while practicing to be a real cowboy or hunter. 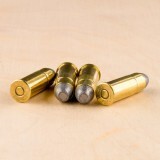 These lead flat nose bullets help with scoring the target, making you into the best shot you can be. 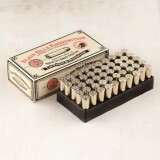 Pick up a 50 round box of this fantastic ammo today! Have you ever wanted to be a cowboy? Now is your chance! With Magtech's massive 200 grain 44-40 Win rounds, you can use one of the most historically significant rifles around, Winchester's Model 1873. 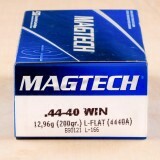 For almost 100 years, Magtech has been creating high quality ammo, and these 44-40 rounds are no different. Reenact your childhood fantasies with Winchester's first centerfire metallic round, brought to you all the way from the innovative factories in Sao Paulo, Brazil. 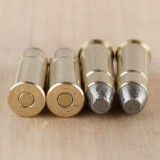 These lead flat nose rounds are great for range training. The flat tip of the bullet helps make the holes in the paper rounder than the usually frayed holes. 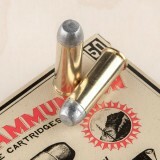 In addition, these rounds are made with brass casings and Boxer primers, which make these rounds great for reloading. 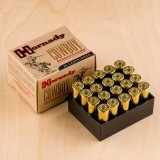 Grab a 50 round box of this cowboy ammo and blast away in your cowboy hat. Developed in 1873, the 44-40 Winchester is a highly powerful handgun and rifle round, originally used in the Winchester Model 1873, which eventually came to be named the gun that won the West. When you are looking for a highly powerful round with historical value, the 44-40 Winchester is tough to outmatch. This round is so popular in fact, that it has killed more deer than almost any other round, making it the perfect round for all your hunting needs. 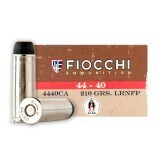 Fiocchi has been around for nearly a century and a half and is the oldest ammunition and firearms company in Italy. Still owned and run by the same family that founded it, Fiocchi puts out some of the highest quality products on the market. 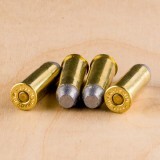 These 210 grain, lead round nose, brass cased, boxer primed rounds fire at 725 feet per second with fantastic accuracy, perfect for honing your skills at the range. 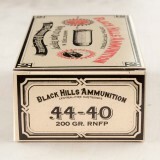 Ammunition from the "Authentic Cowboy Action" line by Black Hills are dependable, soft-recoiling, and legal for cowboy action match use. 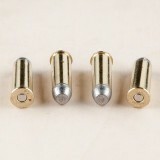 Each of these .44-40 Winchester rounds carries a 200-grain bare lead bullet with a flat nose and rounded body. This shape facilitates clean insertion into loading ports and cylinders while maintaining safety when multiple rounds are stored in the tube magazine of a lever-action rifle. 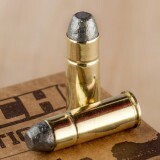 The RNFP (round nose flat point) projectile is crimped into a reloadable brass casing which contains a light load of clean-burning powder that is intended to produce of muzzle velocity of around 800 feet per second. The propellant charge receives ignition from a clean-sparking Boxer primer that is free of mercury or other caustic chemicals. Black Hills has been making ammo for nearly four decades and is known around the country for their quality and hand-inspection requirements.